For a city famed for its 75 museums, it’s no wonder they’d hook up and form a Museum Night. Every year, on the 1st Sat of November, Museum Night kicks in, with participating museums opening till way past midnight and offering up a slew of unique experiences. 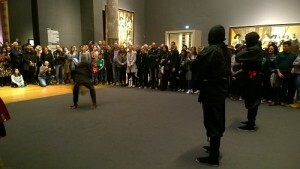 Wanna groove to Pitbull in front of Rembrandt’s masterpiece, The Night Watch, at the Rijksmuseum? 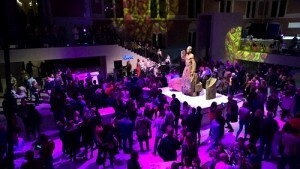 How about spinning around while a DJ spins at the Van Gogh museum? 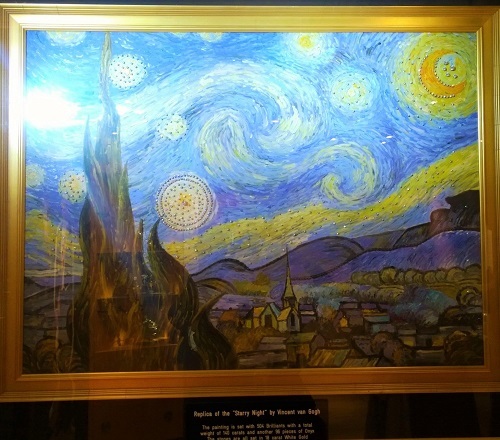 Or sipping champagne while admiring a diamond-studded version of Van Gogh’s Starry Night at the Diamond Museum? It’s as though Amsterdam becomes one whole big party scene on the night, with after parties going on at various clubs as well. 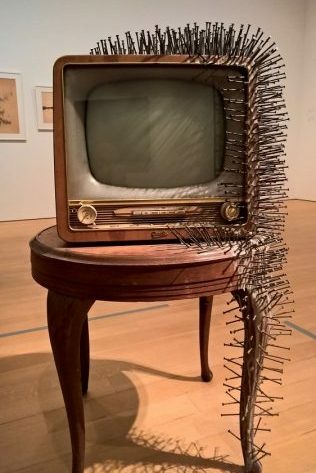 We started off at the Stedelijk and engaged in some intellectual stimulation, experiencing highlights of the Zero movement. 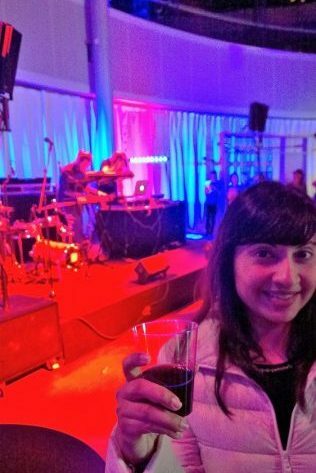 Probably a good idea to go to a more “serious” event at the start while you’re bright-eyed, before you start fading later into the night. After that, it was the Rijksmuseum for a part deux visit, good chance to revisit some of the areas you may have missed out on if you had visited the museum in the day at some other time. 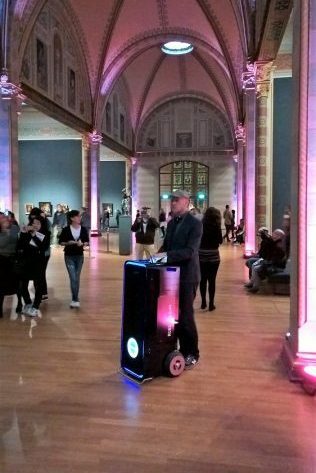 What was cool was the “ninja breakdance” performance and the “mobile DJ” spinning hip-hop beats while travelling through the museum. 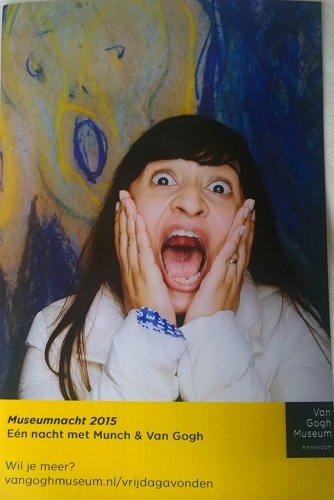 At the Van Gogh museum, we got to let it all out by shouting, or should I say, screaming to activate a camera for a photo booth picture of Munch’s The Scream. Why there was Munch at Van Gogh museum is because at that time, there was a special Munch:Van Gogh exhibition going on. If you look carefully, I think you can see my tonsils. 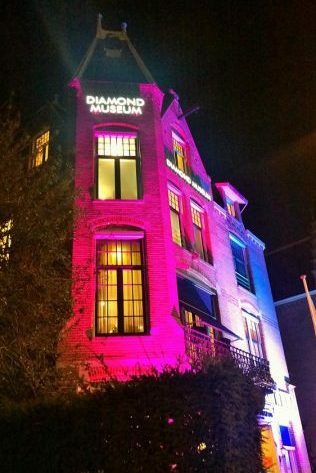 After that, it was only natural to scream again at the diamond-studded replica of Van Gogh’s Starry Night at the Diamond Museum before pretending to walk around in serious contemplation about the diamond era and industry of Amsterdam. When actually, you are just admiring all the rocks on display. After a round of the requisite hotdog, we contemplated a visit to Oude Kerk to participate in the Time Out performance, but seeing as how it was already close to 11pm, and believe me, it is possible to get a sensory overload by then, we decided to make a quick stop at the Amsterdam Museum. And quick it was – although interesting with a history about the city and a special graffiti exhibition, we were just too tired by then. Too tired to even stop for a last beer at the beer tent nearby. So we headed back to our lovely canal house at Amphora B&B, happy enough to have enjoyed this unique museum experience in Amsterdam. Considering how exciting it all sounded while I was here in Singapore, buying tickets online, I’ve got to say – be prepared for a serious lack of information in English. Sure, it’s easy enough to buy tickets online (18.50€) but once you start planning your route for the night, it’s going to be a little difficult as the info online is mostly in Dutch. And some of the programmes are targeted towards the Dutch-speaking crowd, for example, some talks, so you clearly don’t want to get stuck at one of those. Thanks to one of my favourite Amsterdam websites yourlittleblackbook.me, I was able to see recommended events to go to which is important because 7pm-2am does fly by and you want to make sure if there’s something in particular you want to see, you get the timings etc sorted. And yes, I did try to ask the tourist office and also emailed the Museum night organisers before the event, but they really weren’t able to help much. Best advice, see what you can find online (not necessarily from official sources) and usually, hanging around at the Museumplein area might be a good idea as you have the Rijksmuseum, Van Gogh, Stedelijk, Diamond Museum all nearby so you can just hop in and out. Another tip, you can get a bicycle to zip around on the night, but you can get by fine with the trams too. Just buy a 24-hour pass in the morning and it works out cheaper.